Which Of These Halloween Movies Was Critically Panned, But Became A Cult Classic? 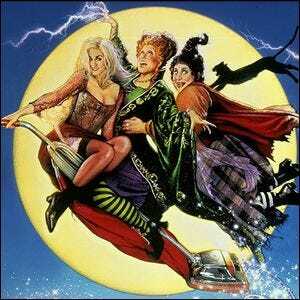 Hocus Pocus (1993) is a comedy horror/fantasy film starring Bette Midler, Kathy Najimy, and Sarah Jessica Parker as the Sanderson Sisters—three witches captured and hung in Salem, Massachusetts who, hundreds of years later, are resurrected on Halloween night by the inadvertent meddling of a virginal teenage male when he lights the Black Flame Candle. The film is now an absolute cult classic, with many people rewatching the film with the same regularity that others watch A Charlie Brown Christmas or Rudolph the Red-Nosed Reindeer around the holidays. The witches are led by Bette Midler, who knows a good line of dialogue when she hears one, and must have suspected that she wasn’t hearing many from this screenplay, because she goes into her hyper mode and tries to use noise as a substitute for acting. Her sidekicks, played by Sarah Jessica Parker and Kathy Najimy, are more fortunate, in that they are given less to do. Ouch. With that kind of scorn, what turned the tide for the film such that it’s now a beloved Halloween staple? Well, despite critics savaging the film as unpolished and a poor fit for both kids and adults alike, it turns out that kids and adults loved watching it together. The film has been run annually, appearing on ABC Family (now Freeform) and the Disney Channel while also getting plenty of replays on various other networks every year. In 2011 alone, 2.8 million people tuned in to watch the movie on ABC Family (making it one of the consistently highest rated titles in their entire Halloween lineup). So perhaps the real question isn’t why the movie achieved cult film status, but why the critics contemporary to its release were unable to see the genius of casting Bette Midler as a crazy eyed, loud, child-stealing witch flanked by adorably incompetent lackeys and put up against the foil of teenagers teamed up with a talking cat.